With increased demand for automation in various industries including domestic, pharmaceutical, food, light and electronics, chemicals, machinery, auto parts, etc., along with the predisposing high temperature conditions in the industry sites, automated line control needs to be taken care of. This is where a high speed slip ring with superior electrical signal transmission needs to be incorporated. They are not only required for power transmission but also for maintaining industrial processes in the event of temperature rise and requirement of high speed operation. The normal temperature of electrical slip ring rarely exceeds 80 degrees Celsius but there are many industries where the temperatures may exceed up to 150 degrees Celsius where ordinary slip rings will not work. This necessitates the use of high speed slip rings with high temperature tolerance with a four channel electrical conductivity. The collector ring composed of metal alloy works in conjunction with the output wiring tray after being set with the device on a rotatory mandrel. The mandrel is connected with the housing and bearing to the electrical connection with the insulator in between the mandrel and collector ring. The brush is connected with the input terminals and is also connected with the collector ring. The brush is made of carbon fiber and silver composites. The brush and the conductive sheet have a temperature resistance of 200 degrees Celsius. The surface roughness of the collector ring ranges up to 0.8 microns. The four ways high speed slip ring has input terminals in contact with the conductive brushes as well as the collector ring. These components are isolated using the bench insulator. During working, the rotary device with the mandrel is connected with the input terminals and power transmission occurs through the brush contacts. This power is further transferred to the collector ring and output terminals which are linked to the electrical equipment. The rotation of the electrical equipment results in the mandrel, terminal and collector ring to rotate simultaneously while the brush maintains continuous power transmission. 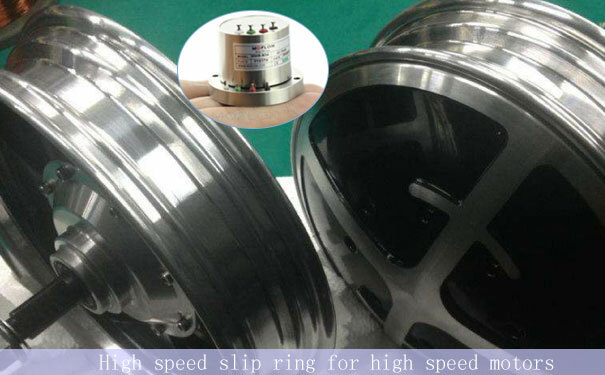 Use of high temperature silver glue helps in enhancing the mechanical strength and efficacy of the slip ring assembly. Carbon fiber which replaces the traditional graphite brush significantly reduces the contact resistance and the coefficient of friction thus increasing speed, maintaining the stability and enhancing shelf life as well as temperature tolerance. The high speed slip ring is a great choice for heavy, high speed and high temperature machinery and the transmission and shelf life is enhanced to 5 times the original value. The easy installation and low maintenance are additional advantages. The four-ways slip ring with simple structure, easy installation and maintenance, work reliably at 150-200 ° C high temperature environment. 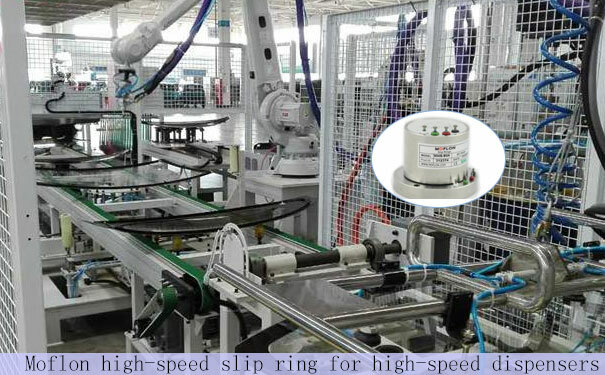 Pri: Use of Continuous Slip Ring Connector VR Wearable Devices Next What is the function of moflon slip ring in the advanced electrical machines?